Throughput and velocity are ways of measuring how fast a team can do work. Knowing how fast a team is going allows the team and their stakeholders to know when something is going to be done. Velocity (http://www.extremeprogramming.org/rules/velocity.html) is a commonly used metric for teams using Extreme Programming or Scrum as their guiding principles for software development. Velocity is a unit-less measure that tells the team how much work they should take on each iteration or sprint. At the first sprint planning meeting the team estimates the top 10 stories and believes that they can complete 6 of them in the next 2 weeks based on the following estimates. At the end of 2 weeks stories A-E are complete and F is started, but not complete. This teams velocity is 16 point per iteration, or about 32 points per month. Note there is no credit for partially done work. The next iteration the team estimates stories until they have stories that add up to 16 points. At the end of the iteration they measure what was actually completed and repeat until the project is done. Velocities cannot be compared across teams because velocity is derived from estimates created by the team and since no team estimates the same way it is impossible to compare them. Velocity is also not a productivity metric. Wanting to see the velocity have a constant increase is like asking to increase the speed of light. Velocities do vary over time due to various factors (like the fact that software is complex), but tend to stabilize if the work and personnel are not fluctuating too much. Throughput is not commonly used in software development, but is becoming more prevalent with the introduction of lean concepts. 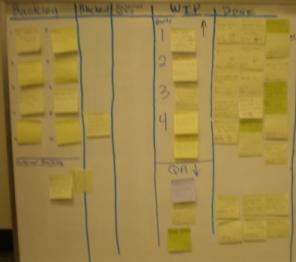 Throughput is most common when using a kanban scheduling board (http://blogs.consultantsguild.com/index.php/wayne/2008/02/01/no-more-iterations) to help manage the delivery of stories. Throughput is the number of things that can be done in a given period of time. 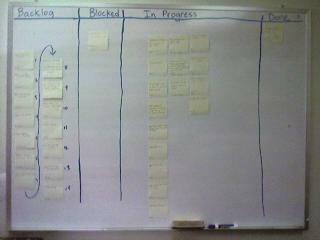 The team pulls the highest priority item off the backlog and works on it until they are done. They note when they started the story and when they finished it. They do this over and over until the project is over. Every month someone summarized the information about the stories that were completed. This team completed 4 stories in January so their throughput is 4 stories per month. Each story takes on average 6 days to complete with a standard deviation of about 5 days. So 90% of stories are completed in 6 days +/- 5 days. With additional data the standard deviation should tighten up unless you have large variance in story size on a regular basis. Even though story E was started in January we don't count it because it was not completed in January. It will go into February's stats. Since throughput relies on actual start and finish times we can derive a predictive measure for forecasting without any estimating. Note that duration ignores the fact that some days are weekends. Like velocity throughput is a team specific number and cannot be compared across teams. Velocity also requires the team to spend time estimating the stories. I'm not sure I ever met a developer who enjoyed estimating and even with planning poker (http://en.wikipedia.org wiki/Planning_poker) most team member do what they can to get out of the estimating meeting yielding less than useful results. One team I know of estimated everything as "?" once they got tired. As in all estimation the results are only as good as the information at hand. When you are estimating something you've never done before the accuracy can be all over the place. The big knock against throughput is that it requires you to have relatively similar size stories in your backlog. This is true to a point. If your stories are not of a similar size your standard deviation will be larger leading to a larger range in your completion date predictions. In my context (stable teams working on product lines) I prefer the kanban/throughput combination. We don't have the dreaded planning meeting and we are still able to tell our stakeholders how many stories they should plan on having in the next release. If you are currently using velocity it is very little overhead to start tracking throughput as a way to double check what your velocity metric is telling you. 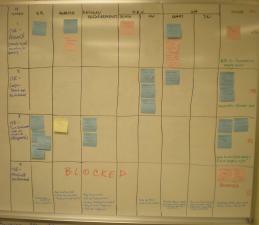 Cory has a great post titled: Scrum-ban | Lean Software Engineering. In it he describes how a team can take advantage of kanban within a Scrum environment. While I am sure that there will be those who insist that Scrum doesn't need to be improved, there are those of us who learned Scrum, practiced Scrum and are aware of it's limitations and want our teams to get even better. 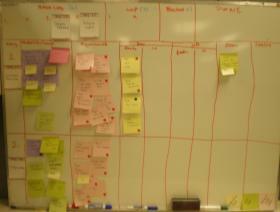 Personally I like kanban for the context I work in. When I explain how we develop software I always try to make sure the other person is aware of the context I made my decisions in and how in other contexts I would not make the same decision. For instance we do not estimate each individual story (although for a short period we did 30 second estimating). We have collected enough data about our performance that we know how many stories per month we complete (~10). Part of this context is a stable team that knows the software and a mature product. 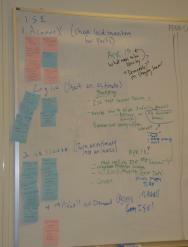 Back in the day I lead contract teams doing work for state and local government. In that context I would go back to estimating because the contracts tended to be fixed price and the team was pulled together just before the project started. Different context, different practices. Previously I posted about my new V-Strom which is a nice bike. 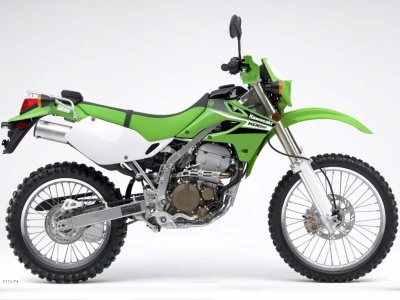 However, after taking it on something more difficult than gravel roads and compared to my wife's Honda CRF150 I knew I needed something much lighter, more dirt oriented, but could still be ridden on the street. 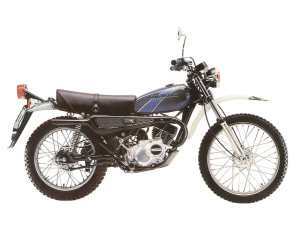 After much research I initially narrowed it down to the Kawasaki KLR 650, Honda RX650L and the Suzuki DR650. The KTM and BMW were out of the picture because of cost. My lingering concern was the weight of the 650s. So what did I buy? A Kawasaki KLX250S!. Hank Wallace turned me on to a post by Allison Shapira where she summarizes a key point from Rob Walker's writeup of the Blue Man Group - the "Why To" manual. This "Actors' Journal" is not so much a how-to manual as a why-to manual; it's not about stage directions, but rather tells the story of the show step by step, from the point of view of the Blue Men. As a decoding and deconstruction of Blue Man's at-times baffling, even mystical behavior, it's a fascinating document, thick with references to everything from Being There to George Bernard Shaw to Robert Motherwell to the caves of Lascaux. Some explanations are straightforward ? "The Blue Men are not aliens" ? and others are more subtle, as when the trio's harmonic "three as one" relationship is described in terms of "blesh," a mix of blend and mesh borrowed from Theodore Sturgeon's science fiction novel More Than Human. What would a "Why To" manual look like for a development team? Miško Hevery has written a great summary of some basic coding rules for testability in his post Writing Testable Code. "I understand how to write tests for your code, but my code is different"
I haven't posted much about my enjoyment of motorcycles, but yesterday I took the next step in my ongoing series of motorcycle experiences. 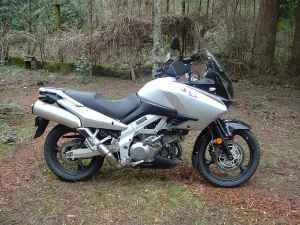 My new bike is a 2005 Suzuki DL1000 otherwise known at the V-strom. I'm looking forward to getting to know it a lot better. The previous owner put a lot of aftermarket farkles on it including heated grips (incredibility useful as it was 40F on the way home) and a custom seat which seems great so far. For the last few years I've been riding this 1998 Ducati ST2, which has been a wonderful bike, but as I get older the position gets more uncomfortable the longer I go. And lets just say it is a tad expensive to maintain. 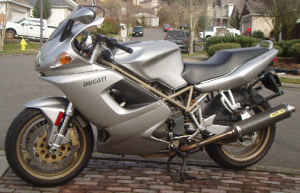 Back in the day I rode one of these to and from work. Things have sure changed.